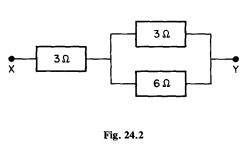 1. is the charge, in coulombs, which passes a point in a circuit in 1 minute when a current of 3 A is flowing? 2. is the potential difference, in volts, required to pass a current of 3 A through a resistor of 6 ohms? Choose the best phrase from the list A to E below to complete each of the sentences in the questions. Each of the following questions or incomplete statements is followed by five suggested answers labelled. Select the best answer in each case. Four lamps each with a resistance of 6 ohms are connected in parallel to a 12 V battery which has no internal resistance. A 8A. B 6 A. C 4A. D 2A. E zero. A 2W. B 6W. C 12W. D 24W. E 72W. 9 What is the charge which passes a point in a conductor when a current of 10 mA flows for 50 s? 12 On which one of the following does the electrical resistance of a wire not depend? 13 Which of the following changes would increase electrical resistance? 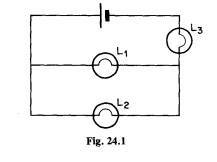 15 Figure 24.1 shows a circuit containing a cell and three similar lamps. Which of the following statements about the brightness of the lamps is correct? A L1 is brighter than L2 which is brighter than L3. C L1 and L2 have the same brightness, but L3 is less bright. D L3 is brighter than L2 which is brighter than L1. E L3 is brighter than L2 which has the same brightness as L1. Two coils of wire of resistance 2 ohms and 4 ohms are connected in parallel with each other, and a 6 volt battery is connected to this combination. 18 What is the effective resistance between X and Y (see Fig. 24.2)? 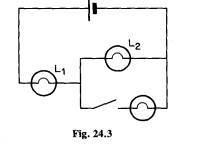 19 Figure 24.3 shows a circuit containing a cell, a switch and three similar lamps. 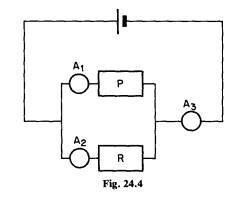 When the switch is closed which of the following statements correctly describes what happens to lamps L1 and L2? 21 What current flows through the headlamp? 22 What is the resistance of the element of an electric fire, when it is in use, if it is rated at 2500 W & 250 V? 23 Which of the following quantities do householders pay for when paying the electricity bill? For each of the questions, one or more than one of the responses (i), (ii), (iii) (or 1, 2, 3) is/are correct. Select the one letter A, B, C, D, E. which represents the correct responses. 24 Which of the following components has/have the same resistance to electric currents flowing through them in either direction? 26 Which of the following statements are true of a voltmeter? 1 It has a low resistance. 2 It is placed in parallel with a piece of apparatus in a circuit. 3 It may have its range increased by the addition of a resistor in series with it. 27 A circuit is connected up as shown. The cell has negligible internal resistance. When the value of the resistor P is reduced which of the following statements is/are true? (i) The reading of ammeter A l increases. (ii) The reading of ammeter A2 decreases. (iii) The reading of ammeter A3 increases. (i) resistance of the conductor. (ii) current carried by the conductor. (iii) time for which the current flows. (i) the power of the lamp is 12 watts. (ii) the resistance of the lamp is 3 ohms. (iii) the energy it consumes in 5 seconds is 15 joules. 1 produces 2000 joules of energy every second. 2 uses 20 kilowatt-hours of electrical energy in 10 hours. 3 passes a current of 8 A when used on 250 V mains.